The Legends have a fashionable force to reckon with. The latest episode of DC’s Legends of Tomorrow saw the full introduction of a new character, Charlie. But I am royally pissed at what the Legends have done to her, and how they’re refusing to address it. “Wet Hot American Bummer” is a largely fun and solid episode of Legends of Tomorrow—with the exception of what I’ll spend most of the article talking about because that’s why I’m writing this, people. Sara and Ray have dragged Ava and John Constantine to summer camp, where they’ll spend the week as counselors. Roasting marshmallows, getting pranked by their preteen charges, and saving children from having their souls sucked out by a really hot swamp witch. Damn, Chad, how’d you get so funky fresh? 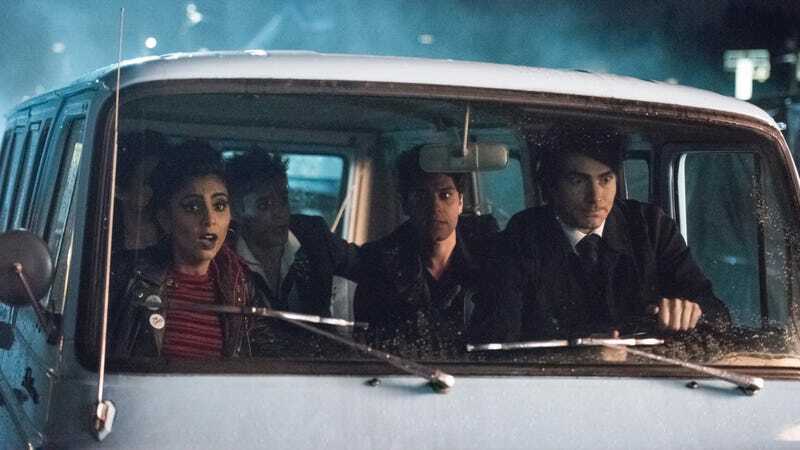 As that’s happening, Zari and Mick have been tasked with babysitting the ship’s newest inhabitant: Charlie, a shapeshifter who Constantine trapped inside the form of Amaya last week. I’m happy to see Maisie Richardson-Sellers’ return to the series in a role that isn’t the absolute worst, but the whole thing strikes me as odd. Charlie could not be any more different than her physical counterpart. She’s brash, she’s violent, she really loves kicking forcefields even when she knows that’s not going to do anything. Overall, I like her...which is why I’m mad at how badly Constantine fucked her over. Maisie Richardson-Sellers as Charlie, the Waverider’s newest recruit. We first met Charlie in “Dancing Queen.” Played by Anjli Mohindra, she was a shapeshifter who’d escaped an interdimensional hell prison, where apparently she was forced to fight terrifying monsters in what was essentially an eternal waking nightmare. She wasn’t bad, as Ray pointed out, she was a survivor. At the end of that episode, she begged for her life by transforming into all the Legends to remind them that they were the real monsters. After she took Amaya’s form, pleading with the Legends to have mercy, Constantine permanently took away her ability to shapeshift. He trapped her in a body that was not her own. John Constantine lobotomized Charlie. That’s his phrasing, not mine. I was frustrated by this plot choice but decided to wait it out a bit before making a judgment call. I wanted to see how this latest episode dealt with the aftermath of such a tragedy. We saw Zari deal with her own guilt over not being able to save her family, so the series knows how to tackle tough issues like this. Charlie has lost the very thing that made her who she is. Something she may have been born with. A fundamental part of her identity. How did they deal with the loss? They didn’t. Charlie barely mentions the fact that she’s no longer a shapeshifter, and not in any way that implies regret or longing. It simply was a thing that happened, like that six-month period you went through a bang phase that did not work on your forehead. Mick tells her she should try joining a team, and she eventually does. The show presents it like Charlie’s already moved on. But I won’t. I’m not going to let this go until we get some damn comeuppance. Justice for Charlie. I’m starting a movement. Charlie didn’t lose a scrunchie or misplace her Hanson Middle of Nowhere audio cassette. She had her core identity stripped away. If something like this had been done to any of the other Legends, it would have been given far more weight. Oh wait, it has. Remember how many episodes Amaya whined about losing her Totem, or how Ray walked around in a daze after his suit was destroyed? We may not know much about Charlie at this point, but we do know she enjoyed being a shapeshifter, and would not easily forgive having that taken away. Unless Charlie is planning a long con to get even at Constantine for magically lobotomizing her, this was all a cheap ploy to get Richardson-Sellers back with a new haircut and her English accent. The character deserves better, and so do we. Now that’s a team of counselors I’d want at my summer camp. Seriously: Why couldn’t Constantine’s spell have temporarily blocked Charlie’s shapeshifting ability, so that she couldn’t go on the run? It would’ve given Charlie time to adjust to Amaya’s form, maybe choosing to keep it because she liked it—or liked tormenting the others on the ship. Plus, having a shapeshifter on board the Waverider would come in handy...and result in hilarious shenanigans. Anyone else catch Constantine’s Swamp Thing Easter egg? I know the CW’s shows probably won’t cross over into DC Universe, but it’s great to know Swamp Thing exists in the Arrowverse too. I thought the young girls who played preteen versions of Sara and Ava were excellent, especially the girl who was playing Ava. They nailed down a lot of mannerisms. I also want to add that Ava and Constantine were terrible camp counselors and it made me so happy. I wouldn’t mind seeing Charlie and Mick date.